Swim Stuff training paddles help you improve technique and strength. When you’re involved in competitive swimming, it’s important to make sure you have the right competitive swimming gear in Dallas, Texas, to help you improve both your strength and your technique. The Swim Stuff training paddles can be one of your most important pieces of equipment. These paddles create greater resistance in the water, which requires more work, increasing your muscles and improving your strength. Your technique is one of the most critical aspects of swimming and finishing well. Before you can start increasing your strength, you need to make sure your technique is perfected. Using the best swimming paddles on the market will help you feel the correct way to swim. When you aren’t swimming correctly, the pull on the training paddles will be even more pronounced, which will tell you something isn’t right. Swim paddles can show you the benefit of keeping your fingers together when you swim and emphasize the need for high elbows and the proper entry angle for your hands. 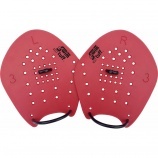 Once you use these training paddles for a while, you will find your technique has greatly improved. After your technique is where you want it to be, you need competitive swimming gear that will help you focus on your strength. The Swim Stuff training paddles will help you improve your strength, as well as your technique. Competitive swimming equipment from D&J Sports offers the opportunities you need to build your muscles and further improve your performance in the water. However, it’s important to make sure you use caution when using this swim training gear. Using swimming paddles too often can cause unnecessary stress on your shoulders, which can lead to an injury. There are many exercises you should use to help improve your swimming. However, when you’re choosing the right competitive swimming gear, you need to find something that will help improve your technique and your strength. Swim Stuff training paddles can help you focus on improving your technique and then continue to help you build strength, particularly in your shoulders, back and arms, so you can always perform your best. If you’re looking for the best competitive swimming gear in Dallas, Texas, contact us. Buying your competitive swimming equipment from D&J Sports ensures you have everything you need to improve your performance.